Including civilians killed by the war's violence, military disease and accidental deaths, the Mexican death toll may have reached 25,000 and the American death toll may have reached 13,283. 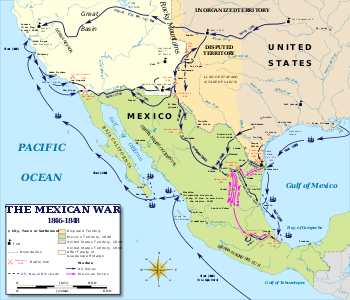 The Mexican–American War,[a] also known in the United States as the Mexican War and in Mexico as the Intervención estadounidense en México (American intervention in Mexico),[b] was an armed conflict between the United States of America and the Second Federal Republic of Mexico from 1846 to 1848. It followed in the wake of the 1845 American annexation of the Republic of Texas, not formally recognized by the Mexican government, disputing the Treaties of Velasco signed by the unstable Mexican caudillo President/General Antonio López de Santa Anna after the Texas Revolution a decade earlier. In 1845, newly elected U.S. President James K. Polk, who saw the annexation of Texas as the first step towards a further expansion of the United States, sent troops to the disputed area and a diplomatic mission to Mexico. After Mexican forces attacked American forces, Polk cited this in his request that Congress declare war. U.S. forces quickly occupied the regional capital of Santa Fe de Nuevo México along the upper Rio Grande and the Pacific coast province of Alta California, and then moved south. Meanwhile, the Pacific Squadron of the U.S. Navy blockaded the Pacific coast farther south in lower Baja California Territory. The U.S. Army under Major General Winfield Scott eventually captured Mexico City through stiff resistance, having marched west from the port of Veracruz on the Gulf Coast, where the Americans staged their first ever amphibious landing. 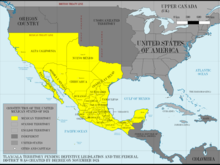 The 1848 Treaty of Guadalupe Hidalgo, forced onto the remnant Mexican government, ended the war and enforced the Mexican Cession of the northern territories of Alta California and Santa Fe de Nuevo México to the United States. The U.S. agreed to pay $15 million compensation for the physical damage of the war and assumed $3.25 million of debt already owed earlier by the Mexican government to U.S. citizens. Mexico acknowledged the loss of what became the State of Texas and accepted the Rio Grande as its northern border with the United States. The victory and territorial expansion Polk envisioned inspired great patriotism in the United States, but the war and treaty drew some criticism in the U.S. for their casualties, monetary cost, and heavy-handedness, particularly early on. The question of how to treat the new acquisitions also intensified the debate over slavery. Mexico's worsened domestic turmoil and losses of life, territory and national prestige left it in what prominent Mexicans called a "state of degradation and ruin". Mexico obtained independence from Spain and the Spanish Empire with the Treaty of Córdoba in 1821. It briefly experimented with monarchy, but became a republic in 1824. This government was characterized by instability, leaving it ill-prepared for international conflict when war broke out only two decades later, in 1846. In the decades preceding the war, Native American raids in Mexico's sparsely settled north prompted the Mexican government to sponsor migration from the United States to the Mexican province of Texas to create a buffer. However, the newly named "Texans" revolted against the Mexican government of President/dictator Antonio López de Santa Anna, who had usurped the Mexican Constitution of 1824, in the subsequent 1836 Texas Revolution, creating a republic not recognized by Mexico, which still claimed it as part of its national territory. In 1845, the Texan Republic agreed to an offer of annexation by the U.S. Congress and became the 28th state in the Union on December 29 that year. Mexico's military and diplomatic capabilities declined after it attained independence from Spain in 1821 and left the northern one-half of the country vulnerable to the Comanche, Apache, and Navajo native Americans. The Comanche, in particular, took advantage of the Mexican state to undertake large-scale raids hundreds of miles into the country to acquire livestock for their own use and to supply an expanding market in Texas and the U.S. The northern area of Mexico was sparsely settled and not well controlled politically by the government based in Mexico City. After independence, Mexico contended with internal struggles that sometimes verged on civil war and the northern frontier was not a high priority. In northern Mexico, the end of Spanish rule was marked by the end of financing for presidios and for gifts to Native Americans to maintain the peace. The Comanche and Apache were successful in raiding for livestock and looting much of northern Mexico outside the scattered cities. Northern Mexico was a violent and chaotic area due to the Indian raids. The raids after 1821 resulted in the death of thousands of Mexicans, halted most transportation and communications, and decimated the ranching industry that was a mainstay of the northern economy. As a result, the demoralized civilian population of northern Mexico put up little resistance to the invading U.S. army. Distance and hostile activity from Native Americans also made communications and trade between the heartland of Mexico and provinces such as Alta California and New Mexico difficult. As a result, New Mexico was dependent on the overland Santa Fe Trail trade with the United States at the outbreak of the Mexican–American War. 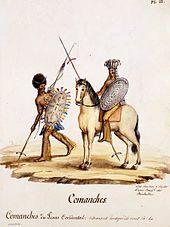 The Mexican government's policy of settlement of US citizens in its province of Tejas was aimed at expanding control into Comanche lands, the Comancheria. Instead of settlement occurring in the central and west of the province, people settled in East Texas, where there was rich farmland and which was contiguous to southern US slave states. As settlers poured in from the US, the Mexican government discouraged further settlement, with its 1829 abolition of slavery. In 1836, Mexico was relatively united in refusing to recognize the independence of Texas. Mexico threatened war with the United States if it annexed the Republic of Texas. Meanwhile, U.S. President Polk's assertion of Manifest Destiny was focusing United States interest on westward expansion beyond its existing national borders. During the Spanish colonial era, the Californias (i.e., the Baja California peninsula and Alta California) were sparsely settled. After Mexico became independent, it shut down the missions and reduced its military presence. In 1842, the US minister in Mexico, Waddy Thompson Jr., suggested Mexico might be willing to cede Alta California to settle debts, saying: "As to Texas, I regard it as of very little value compared with California, the richest, the most beautiful, and the healthiest country in the world ... with the acquisition of Upper California we should have the same ascendency on the Pacific ... France and England both have had their eyes upon it." US President John Tyler's administration suggested a tripartite pact that would settle the Oregon boundary dispute and provide for the cession of the port of San Francisco from Mexico. Lord Aberdeen declined to participate but said Britain had no objection to U.S. territorial acquisition there. The British minister in Mexico, Richard Pakenham, wrote in 1841 to Lord Palmerston urging "to establish an English population in the magnificent Territory of Upper California", saying that "no part of the World offering greater natural advantages for the establishment of an English colony ... by all means desirable ... that California, once ceasing to belong to Mexico, should not fall into the hands of any power but England ... daring and adventurous speculators in the United States have already turned their thoughts in this direction." But by the time the letter reached London, Sir Robert Peel's Tory government, with its Little England policy, had come to power and rejected the proposal as expensive and a potential source of conflict. A significant number of influential Californios were in favor of annexation, either by the United States or by the United Kingdom. Pío de Jesús Pico IV, the last governor of Alta California, was in favor of British annexation. The Republic of Texas: The present-day outlines of the individual U.S. states are superimposed on the boundaries of 1836–1845. In 1800, Spain's colonial province of Texas (Tejas) had few inhabitants, with only about 7,000 non-Indian settlers. The Spanish crown developed a policy of colonization to more effectively control the territory. After independence, the Mexican government implemented the policy, granting Moses Austin, a banker from Missouri, a large tract of land in Texas. Austin died before he could bring his plan of recruiting American settlers for the land to fruition, but his son, Stephen F. Austin, brought over 300 American families into Texas. This started the steady trend of migration from the United States into the Texas frontier. Austin's colony was the most successful of several colonies authorized by the Mexican government. The Mexican government intended the new settlers to act as a buffer between the Tejano residents and the Comanches, but the non-Hispanic colonists tended to settle where there was decent farmland and trade connections with American Louisiana, which the United States had acquired in the Louisiana Purchase, rather than further west where they would have been an effective buffer against the Indians. In 1829, as a result of the large influx of American immigrants, the non-Hispanic outnumbered native Spanish speakers in the Texas territory. President Vicente Guerrero, a hero of Mexican independence, moved to gain more control over Texas and its influx of southern non-Hispanic colonists and discourage further immigration by abolishing slavery in Mexico. The Mexican government also decided to reinstate the property tax and increase tariffs on shipped American goods. The settlers and many Mexican businessmen in the region rejected the demands, which led to Mexico closing Texas to additional immigration, which continued from the United States into Texas illegally. In 1834, General Antonio López de Santa Anna became the centralist dictator of Mexico, abandoning the federal system. He decided to quash the semi-independence of Texas, having succeeded in doing so in Coahuila (in 1824, Mexico had merged Texas and Coahuila into the enormous state of Coahuila y Tejas). Finally, Stephen F. Austin called Texians to arms, and they declared independence from Mexico in 1836. After Santa Anna defeated the Texians in the Battle of the Alamo, he was defeated by the Texian Army commanded by General Sam Houston and captured at the Battle of San Jacinto; he signed a treaty recognizing the independence of Texas. Texas consolidated its status as an independent republic and received official recognition from Britain, France, and the United States, which all advised Mexico not to try to reconquer the new nation. Most Texians wanted to join the United States of America, but annexation of Texas was contentious in the US Congress, where Whigs were largely opposed. In 1845 Texas agreed to the offer of annexation by the US Congress and became the 28th state on December 29, 1845. In 1845, newly elected U.S. President James K. Polk made a proposition to purchase Alta California and Santa Fe de Nuevo México from Mexico, and to agree upon the Rio Grande river as the southern border of United States. When that offer was rejected, President Polk moved U.S. troops commanded by Major General Zachary Taylor further south into the disputed Nueces Strip. The border of Texas as an independent state was originally never settled. 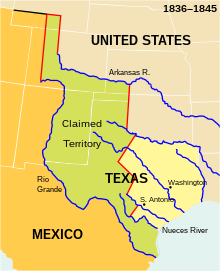 The Republic of Texas claimed land up to the Rio Grande based on the Treaties of Velasco, but Mexico refused to accept these as valid, claiming that the Rio Grande in the treaty was the Nueces, and referred to the Rio Grande as the Rio Bravo. The ill-fated Texan Santa Fe Expedition of 1841 attempted to realize the claim to New Mexican territory east of the Rio Grande, but its members were captured and imprisoned. Reference to the Rio Grande boundary of Texas was omitted from the US Congress's annexation resolution to help secure passage after the annexation treaty failed in the Senate. President Polk claimed the Rio Grande boundary, and when Mexico sent forces over the Rio Grande, this provoked a dispute. In July 1845, Polk sent General Zachary Taylor to Texas, and by October 3,500 Americans were on the Nueces River, ready to take by force the disputed land. Polk wanted to protect the border and also coveted for the U.S. the continent clear to the Pacific Ocean. At the same time Polk wrote to the American consul in the Mexican territory of Alta California, disclaiming American ambitions in California, but offering to support independence from Mexico or voluntary accession to the United States, and warning that the United States would oppose a British or French takeover. To end another war scare with the United Kingdom over the Oregon Country, Polk signed the Oregon Treaty dividing the territory, angering northern Democrats who felt he was prioritizing Southern expansion over Northern expansion. In the Winter of 1845–46, the federally commissioned explorer John C. Frémont and a group of armed men appeared in Alta California. After telling the Mexican governor and the American Consul Larkin he was merely buying supplies on the way to Oregon, he instead went to the populated area of California and visited Santa Cruz and the Salinas Valley, explaining he had been looking for a seaside home for his mother. Mexican authorities became alarmed and ordered him to leave. Frémont responded by building a fort on Gavilan Peak and raising the American flag. Larkin sent word that Frémont's actions were counterproductive. Frémont left California in March but returned to California and took control of the California Battalion following the outbreak of the Bear Flag Revolt in Sonoma. In November 1845, Polk sent John Slidell, a secret representative, to Mexico City with an offer to the Mexican government of $25 million for the Rio Grande border in Texas and Mexico's provinces of Alta California and Santa Fe de Nuevo México. US expansionists wanted California to thwart British ambitions in the area and to gain a port on the Pacific Ocean. Polk authorized Slidell to forgive the $3 million owed to US citizens for damages caused by the Mexican War of Independence and pay another $25 to $30 million in exchange for the two territories. Mexico was not inclined nor able to negotiate. In 1846 alone, the presidency changed hands four times, the war ministry six times, and the finance ministry sixteen times. Mexican public opinion and all political factions agreed that selling the territories to the United States would tarnish the national honor. Mexicans who opposed direct conflict with the United States, including President José Joaquín de Herrera, were viewed as traitors. Military opponents of de Herrera, supported by populist newspapers, considered Slidell's presence in Mexico City an insult. When de Herrera considered receiving Slidell to settle the problem of Texas annexation peacefully, he was accused of treason and deposed. After a more nationalistic government under General Mariano Paredes y Arrillaga came to power, it publicly reaffirmed Mexico's claim to Texas; Slidell, convinced that Mexico should be "chastised", returned to the US. General Antonio López de Santa Anna was a military hero who became president of Mexico on multiple occasions. The Mexican Army's intervention in politics was an ongoing issue during much of the mid-nineteenth century. The Mexican Army emerged from the war of independence (1810–1821) as a weak and divided force. Before the war with the United States, the military faced both internal and foreign challenges. The Spanish still occupied the coastal fortress of San Juan de Ulúa, and Spain did not recognize Mexico's independence, so that the new nation was at risk for invasion. In 1829, the Spanish attempted to reconquer their former colony and Antonio López de Santa Anna became a national hero defending the homeland. The army had a set of privileges (fueros), established in the colonial era, that gave it jurisdiction over many aspects of its affairs. In general, the military supported conservative positions, advocating for a strong central government and upholding privileges of the military and the Catholic Church. Some military men exercised power in local areas as caudillos and resisted central command. Liberal politicians, such as Valentín Gómez Farías, sought to rein in the military's power. The military faced insurrections and separatist movements in Tabasco, Yucatán, and Texas. The French blockaded Veracruz in 1838 to collect debts, a conflict known to history as the Pastry War. Compounding the demands on the Mexican military, there were continuing Indian challenges to power in the northern region. On the Mexican side, only 7 of the 19 states that formed the Mexican federation sent soldiers, armament, and money for the war effort, as the young Republic had not yet developed a sense of a unifying, national identity. Mexican soldiers were not easily melded into an effective fighting force. Santa Anna said "the leaders of the army did their best to train the rough men who volunteered, but they could do little to inspire them with patriotism for the glorious country they were honored to serve." According to leading conservative politician Lucas Alamán, the "money spent on arming Mexican troops merely enabled them to fight each other and 'give the illusion' that the country possessed an army for its defense." However, an officer criticized Santa Anna's training of troops, "The cavalry was drilled only in regiments. The artillery hardly ever maneuvered and never fired a blank shot. The general in command was never present on the field of maneuvers, so that he was unable to appreciate the respective qualities of the various bodies under his command ... If any meetings of the principal commanding officers were held to discuss the operations of the campaign, it was not known, nor was it known whether any plan of campaign had been formed." One of the contributing factors to loss of the war by Mexico was the inferiority of their weapons. The Mexican army was using surplus British muskets (e.g. Brown Bess) from the Napoleonic Wars period. While at the beginning of the war the majority of American soldiers were still equipped with the very similar Springfield 1816 flintlock muskets, more reliable caplock models gained large inroads within the rank and file as the conflict progressed. Some US troops carried radically modern weapons that gave them a significant advantage over their Mexican counterparts, such as the Springfield 1841 rifle of the Mississippi Rifles and the Colt Paterson revolver of the Texas Rangers. In the later stages of the war, the US Mounted Rifles were issued Colt Walker revolvers, of which the US Army had ordered 1,000 in 1846. Most significantly, throughout the war the superiority of the US artillery often carried the day. While technologically Mexican and American artillery operated on the same plane, US army training as well as the quality and reliability of their logistics gave US guns and cannoneers a significant edge. Desertion was a major problem for the Mexican army, depleting forces on the eve of battle. Most soldiers were peasants who held loyalty to their village and family, but not to the generals who had conscripted them. Often hungry and ill, under-equipped, only partially trained, and never well paid, the soldiers were held in contempt by their officers and had little reason to fight the invading US forces. Looking for their opportunity, many slipped away from camp to find their way back to their home village. "The Mexican army of that day was hardly an organization. The private soldier was picked from the lower class of the inhabitants when wanted; his consent was not asked; he was poorly clothed, worse fed, and seldom paid. He was turned adrift when no longer wanted. The officers of the lower grades were but little superior to the men. With all this I have seen as brave stands made by some of these men as I have ever seen made by soldiers. Now Mexico has a standing army larger then the United States. They have a military school modeled after West Point. Their officers are educated and, no doubt, very brave. The Mexican war of 1846–8 would be an impossibility in this generation." Women who traveled with the men in the Mexican army were known as soldaderas. While they only carried their packs, there were recorded instances where the soldaderas would join in the battle alongside the men. These women were involved in street fighting during the defence of Mexico City and Monterey. Some women such as Dos Amandes and Maria Josefa Zozaya would be remembered as heroes. Political divisions inside Mexico were another factor in the US victory. Inside Mexico, the centralistas and republicanos vied for power, and at times these two factions inside Mexico's military fought each other rather than the invading US Army. Another faction called the monarchists, whose members wanted to install a monarch (some advocated rejoining Spain), further complicated matters. This third faction would rise to predominance in the period of the French intervention in Mexico. 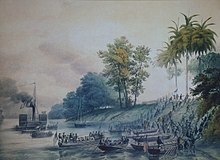 The ease of the American landing at Veracruz was in large part due to civil warfare in Mexico City, which made any real defense of the port city impossible. As Gen. Santa Anna said, "However shameful it may be to admit this, we have brought this disgraceful tragedy upon ourselves through our interminable in-fighting." 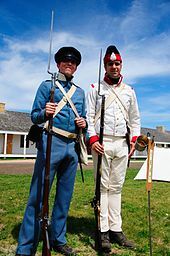 On the U.S. side, the war was fought by regiments of regulars and various regiments, battalions, and companies of volunteers from the different states of the Union as well as Americans and some Mexicans in the California and New Mexico territories. On the West Coast, the US Navy fielded a battalion of sailors, in an attempt to recapture Los Angeles. Although the US Army and Navy were not large at the outbreak of the war, the officers were generally well trained and the numbers of enlisted men fairly large compared to Mexico's. At the beginning of the war, the US Army had eight regiments of infantry (three battalions each), four artillery regiments and three mounted regiments (two dragoons, one of mounted rifles). These regiments were supplemented by 10 new regiments (nine of infantry and one of cavalry) raised for one year of service by the act of Congress from February 11, 1847. "The victories in Mexico were, in every instance, over vastly superior numbers. There were two reasons for this. Both General Scott and General Taylor had such armies as are not often got together. At the battles of Palo Alto and Resaca-de-la-Palma, General Taylor had a small army, but it was composed exclusively of regular troops, under the best of drill and discipline. Every officer, from the highest to the lowest, was educated in his profession, not at West Point necessarily, but in the camp, in garrison, and many of them in Indian wars. The rank and file were probably inferior, as material out of which to make an army, to the volunteers that participated in all the later battles of the war; but they were brave men, and then drill and discipline brought out all there was in them. A better army, man for man, probably never faced an enemy than the one commanded by General Taylor in the earliest two engagements of the Mexican war. The volunteers who followed were of better material, but without drill or discipline at the start. They were associated with so many disciplined men and professionally educated officers, that when they went into engagements it was with a confidence they would not have felt otherwise. They became soldiers themselves almost at once. All these conditions we would enjoy again in case of war." 1,563 US soldiers are buried in the Mexico City National Cemetery, which is maintained by the American Battle Monuments Commission. In 1846, after Polk ordered General Taylor's troops into the disputed territory, Mexican forces attacked an American Army outpost ("Thornton Affair") in the occupied territory, killing 12 U.S. soldiers and capturing 52. These same Mexican troops later laid siege to an American fort along the Rio Grande. Polk cited this attack as an invasion of U.S. territory and requested that the Congress declare war. President Polk ordered General Taylor and his forces south to the Rio Grande, entering the territory that Mexicans disputed. Mexico laid claim to all the lands as far north as the Nueces River—about 150 mi (240 km) north of the Rio Grande. The U.S. claimed that the border was the Rio Grande, citing the 1836 Treaties of Velasco. However, Mexico rejected the treaties and refused to negotiate, instead still claiming all of Texas. Taylor ignored Mexican demands to withdraw to the Nueces. He constructed a makeshift fort (later known as Fort Brown/Fort Texas) on the banks of the Rio Grande opposite the city of Matamoros, Tamaulipas. The Mexican forces under General Santa Anna immediately prepared for war. On April 25, 1846, a 2,000-man Mexican cavalry detachment attacked a 70-man U.S. patrol under the command of Captain Seth Thornton, which had been sent into the contested territory north of the Rio Grande and south of the Nueces River. In the Thornton Affair, the Mexican cavalry routed the patrol, killing 11 American soldiers. Regarding the beginning of the war, Ulysses S. Grant, who had opposed the war but served as an army lieutenant in Taylor's Army, claims in his Personal Memoirs (1885) that the main goal of the U.S. Army's advance from Nueces River to Rio Grande was to provoke the outbreak of war without attacking first, to debilitate any political opposition to the war. Mexico showing no willingness to come to the Nueces to drive the invaders from her soil, it became necessary for the "invaders" to approach to within a convenient distance to be struck. Accordingly, preparations were begun for moving the army to the Rio Grande, to a point near Matamoras [sic]. It was desirable to occupy a position near the largest centre of population possible to reach, without absolutely invading territory to which we set up no claim whatever. A few days after the defeat of the U.S. troops by General Arista, the Siege of Fort Texas began on May 3, 1846. Mexican artillery at Matamoros opened fire on Fort Texas, which replied with its own guns. The bombardment continued for 160 hours and expanded as Mexican forces gradually surrounded the fort. Thirteen U.S. soldiers were injured during the bombardment, and two were killed. Among the dead was Jacob Brown, after whom the fort was later named. On May 8, Zachary Taylor and 2,400 troops arrived to relieve the fort. However, General Arista rushed north and intercepted him with a force of 3,400 at Palo Alto. The U.S. Army employed "flying artillery", their term for horse artillery, a type of mobile light artillery that was mounted on horse carriages with the entire crew riding horses into battle. It had a devastating effect on the Mexican army. In contrast to the "flying artillery" of the Americans, the Mexican cannons at the Battle of Palo Alto fired at such slow velocities that it was possible for American soldiers to dodge artillery rounds. The Mexicans replied with cavalry skirmishes and their own artillery. The U.S. flying artillery somewhat demoralized the Mexican side, and seeking terrain more to their advantage, the Mexicans retreated to the far side of a dry riverbed (resaca) during the night. It provided a natural fortification, but during the retreat, Mexican troops were scattered, making communication difficult. During the Battle of Resaca de la Palma the next day, the two sides engaged in fierce hand to hand combat. The U.S. Cavalry managed to capture the Mexican artillery, causing the Mexican side to retreat—a retreat that turned into a rout. Fighting on unfamiliar terrain, his troops fleeing in retreat, Arista found it impossible to rally his forces. Mexican casualties were heavy, and the Mexicans were forced to abandon their artillery and baggage. Fort Brown inflicted additional casualties as the withdrawing troops passed by the fort. Many Mexican soldiers drowned trying to swim across the Rio Grande. Both these engagements were fought before war was declared. In 1846, relations between the two countries had deteriorated considerably and on April 23, 1846, the president of Mexico issued a proclamation, declaring Mexico's intent to fight a "defensive war" against the encroachment of the United States. On April 25, 1846, two thousand Mexican cavalry crossed into the disputed territory and routed a small detachment of American soldiers, sparking the "Thornton Affair". Polk received word of the Thornton Affair, which, added to the Mexican government's rejection of Slidell, Polk believed, constituted a casus belli (cause for war). His message to Congress on May 11, 1846, claimed that "Mexico has passed the boundary of the United States, has invaded our territory and shed American blood upon American soil." The U.S. Congress approved the declaration of war on May 13, 1846, after a few hours of debate, with southern Democrats in strong support. Sixty-seven Whigs voted against the war on a key slavery amendment, but on the final passage only 14 Whigs voted no, including Rep. John Quincy Adams. In Mexico, although President Paredes issued a manifesto on May 23, 1846, and a declaration of a defensive war on April 23, both of which are considered by some the de facto start of the war, Mexico officially declared war by Congress on July 7, 1846. After the U.S. declared war on Mexico in 1846, Antonio López de Santa Anna wrote a letter to Mexico City stating he did not care to return to the presidency but would like to come out of exile in Cuba to use his military experience to reclaim Texas for Mexico. President Valentín Gómez Farías, driven to desperation, accepted the offer and allowed Santa Anna to return. Unbeknownst to President Farías, Santa Anna had secretly been dealing with U.S. representatives to sell all contested territory to the U.S. at a reasonable price on the condition that he be allowed back in Mexico through the U.S. naval blockades. Santa Anna returned to Mexico taking his place at the head of the army. Once in this position, he went back on his word, declaring himself president. As president, Santa Anna made an unsuccessful attempt to fight off the U.S. invasion. Santa Anna left for Veracruz in August 1846. The people of Mexico did not focus on Santa Anna's many military shortcomings and betrayals, opting to see him as a hero that never abandoned his people when they needed him most. Antonio López de Santa Anna remained popular among the Mexican people for years after the war. Despite his history of corruption, local people often cite Santa Anna as one of the most reliable people when it came to protecting Mexico from invasion. Following defeat in the Mexican–American War in 1848, Santa Anna once again went into exile, this time to Kingston, Jamaica. Abraham Lincoln in his late 30s as a member of the U.S. House of Representatives, when he opposed the Mexican–American War. Photo taken by one of Lincoln's law students around 1846. 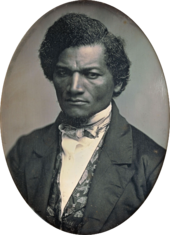 Ex-slave and prominent anti-slavery advocate Frederick Douglass (circa 1847–52) opposed the Mexican–American War. Henry David Thoreau spent a night in jail for not paying poll taxes to support the war and later wrote Civil Disobedience. In the United States, increasingly divided by sectional rivalry, the war was a partisan issue and an essential element in the origins of the American Civil War. Most Whigs in the North and South opposed it; most Democrats supported it. Southern Democrats, animated by a popular belief in Manifest Destiny, supported it in hope of adding slave-owning territory to the South and avoiding being outnumbered by the faster-growing North. John L. O'Sullivan, editor of the Democratic Review, coined this phrase in its context, stating that it must be "our manifest destiny to overspread the continent allotted by Providence for the free development of our yearly multiplying millions." Northern antislavery elements feared the expansion of the Southern Slave Power; Whigs generally wanted to strengthen the economy with industrialization, not expand it with more land. Among the most vocal opposing the war in the House of Representatives was John Quincy Adams of Massachusetts. Adams had first voiced concerns about expanding into Mexican territory in 1836 when he opposed Texas annexation. He continued this argument in 1846 for the same reason. War with Mexico would add new slavery territory to the nation. When the vote to go to war with Mexico came to a vote on May 13, Adams spoke a resounding "No!" in the chamber. Only 13 others followed his lead. Ex-slave Frederick Douglass opposed the war and was dismayed by the weakness of the anti-war movement. "The determination of our slave holding president, and the probability of his success in wringing from the people, men and money to carry it on, is made evident by the puny opposition arrayed against him. None seem willing to take their stand for peace at all risks." Democrats wanted more land; northern Democrats were attracted by the possibilities in the far northwest. Joshua Giddings led a group of dissenters in Washington D.C. He called the war with Mexico "an aggressive, unholy, and unjust war", and voted against supplying soldiers and weapons. He said: "In the murder of Mexicans upon their own soil, or in robbing them of their country, I can take no part either now or hereafter. The guilt of these crimes must rest on others. I will not participate in them. Fellow Whig Abraham Lincoln contested Polk's causes for the war. Polk had said that Mexico had "shed American blood upon American soil". Lincoln submitted eight "Spot Resolutions", demanding that Polk state the exact spot where Thornton had been attacked and American blood shed, and clarify whether or not that location was actually American soil, or in fact had been claimed by Spain and Mexico. Whig Senator Thomas Corwin of Ohio gave a long speech indicting presidential war in 1847. Whig leader Robert Toombs of Georgia declared: "This war is nondescript ... We charge the President with usurping the war-making power ... with seizing a country ... which had been for centuries, and was then in the possession of the Mexicans. ... Let us put a check upon this lust of dominion. We had territory enough, Heaven knew. Northern abolitionists attacked the war as an attempt by slave-owners to strengthen the grip of slavery and thus ensure their continued influence in the federal government. Prominent artists and writers opposed the war. 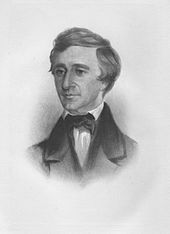 The Transcendentalist writers Henry David Thoreau and Ralph Waldo Emerson attacked the popular war. Thoreau, who served jail time for his opposition, turned a lecture into an essay now known as Civil Disobedience. Emerson was succinct, predicting that, "The United States will conquer Mexico, but it will be as a man who swallowed the arsenic which brings him down in turn. Mexico will poison us." Events proved him right, as arguments over the expansion of slavery in the lands seized from Mexico would fuel the drift to civil war just a dozen years later. Democratic Representative David Wilmot introduced the Wilmot Proviso, which would prohibit slavery in new territory acquired from Mexico. Wilmot's proposal passed the House but not the Senate, and it spurred further hostility between the factions. Besides alleging that the actions of Mexican military forces within the disputed boundary lands north of the Rio Grande constituted an attack on American soil, the war's advocates viewed the territories of New Mexico and California as only nominally Mexican possessions with very tenuous ties to Mexico. They saw the territories as actually unsettled, ungoverned, and unprotected frontier lands, whose non-aboriginal population, where there was any at all, represented a substantial—in places even a majority—American component. Moreover, the territories were feared to be under imminent threat of acquisition by America's rival on the continent, the British. President Polk reprised these arguments in his Third Annual Message to Congress on December 7, 1847. He scrupulously detailed his administration's position on the origins of the conflict, the measures the U.S. had taken to avoid hostilities, and the justification for declaring war. He also elaborated upon the many outstanding financial claims by American citizens against Mexico and argued that, in view of the country's insolvency, the cession of some large portion of its northern territories was the only indemnity realistically available as compensation. This helped to rally congressional Democrats to his side, ensuring passage of his war measures and bolstering support for the war in the U.S. The Mexican–American War was the first American war that was covered by mass media, primarily the penny press and was the first foreign war covered primarily by American correspondents. Press coverage in the United States was characterized by support for the war and widespread public interest and demand for coverage of the conflict. Mexican coverage of the war (both written by Mexicans and Americans based in Mexico) was affected by press censorship, first by the Mexican government and later by the American military. The coverage of the war was an important development in the U.S., with journalists as well as letter-writing soldiers giving the public in the U.S. "their first-ever independent news coverage of warfare from home or abroad." During the war, inventions such as the telegraph created new means of communication that updated people with the latest news from the reporters, who were on the scene. The most important of these was George Wilkins Kendall, a Northerner who wrote for the New Orleans Picayune, and whose collected Dispatches from the Mexican War constitute an important primary source for the conflict. With more than a decade's experience reporting urban crime, the "penny press" realized the public's voracious demand for astounding war news. Moreover, Shelley Streetby demonstrates that the print revolution (1830s–1840s), which preceded the U.S.-Mexican War, made it possible for the distribution of cheap newspapers throughout the country. This was the first time in American history that accounts by journalists, instead of opinions of politicians, had great influence in shaping people's opinions about and attitudes toward a war. Along with written accounts of the war, there were war artists giving a visual dimension to the war at the time and immediately afterward. Carl Nebel's visual depictions of the war are well known. By getting constant reports from the battlefield, Americans became emotionally united as a community. News about the war always caused extraordinary popular excitement. In the Spring of 1846, news about Zachary Taylor's victory at Palo Alto brought up a large crowd that met in a cotton textile town of Lowell, Massachusetts. New York celebrated the twin victories at Veracruz and Buena Vista in May 1847. Among fireworks and illuminations, they had a "grand procession" of about 400,000 people. Generals Taylor and Scott became heroes for their people and later became presidential candidates. United States Army General Stephen W. Kearny moved southwest from Fort Leavenworth, Kansas with about 1,700 men in his Army of the West. Kearny's orders were to secure the territories Nuevo México and Alta California. 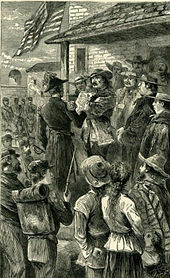 In Santa Fe, Governor Manuel Armijo wanted to avoid battle, but on August 9, Catholic priests, Diego Archuleta (the young regular-army commander), and the young militia officers Manuel Chaves and Miguel Pino forced him to muster a defense. Armijo set up a position in Apache Canyon, a narrow pass about 10 miles (16 km) southeast of the city. However, on August 14, before the American army was even in view, he decided not to fight. (An American named James Magoffin claimed he had convinced Armijo and Archuleta to follow this course; an unverified story says he bribed Armijo.) When Pino, Chaves, and some of the militiamen insisted on fighting, Armijo ordered the cannon pointed at them. The New Mexican army retreated to Santa Fe, and Armijo fled to Chihuahua. Kearny and his troops encountered no Mexican forces when they arrived on August 15. Kearny and his force entered Santa Fe and claimed the New Mexico Territory for the United States without a shot being fired. Kearny declared himself the military governor of the New Mexico Territory on August 18 and established a civilian government. American officers with a background in law drew up a temporary legal system for the territory called the Kearny Code. Kearny then took the remainder of his army west to Alta California. When he departed with his forces for California, he left Colonel Sterling Price in command of U.S. forces in New Mexico. He appointed Charles Bent as New Mexico's first territorial governor. Following Kearny's departure, dissenters in Santa Fe plotted a Christmas uprising. When the plans were discovered by the U.S. authorities, the dissenters postponed the uprising. They attracted numerous Indian allies, including Puebloan peoples, who also wanted to push the Americans from the territory. On the morning of January 19, 1847, the insurrectionists began the revolt in Don Fernando de Taos, present-day Taos, New Mexico, which later gave it the name the Taos Revolt. They were led by Pablo Montoya, a New Mexican, and Tomás Romero, a Taos pueblo Indian also known as Tomasito (Little Thomas). Romero led an Indian force to the house of Governor Charles Bent, where they broke down the door, shot Bent with arrows, and scalped him in front of his family. They moved on, leaving Bent still alive. With his wife Ignacia and children, and the wives of friends Kit Carson and Thomas Boggs, the group escaped by digging through the adobe walls of their house into the one next door. When the insurgents discovered the party, they killed Bent, but left the women and children unharmed. The next day a large armed force of approximately 500 New Mexicans and Pueblo attacked and laid siege to Simeon Turley's mill in Arroyo Hondo, several miles outside of Taos. Charles Autobees, an employee at the mill, saw the men coming. He rode to Santa Fe for help from the occupying U.S. forces. Eight to ten mountain men were left at the mill for defense. After a day-long battle, only two of the mountain men survived, John David Albert and Thomas Tate Tobin, Autobees' half brother. Both escaped separately on foot during the night. The same day New Mexican insurgents killed seven American traders who were passing through the village of Mora. At most, 15 Americans were killed in both actions on January 20. The U.S. military moved quickly to quash the revolt; Col. Price led more than 300 U.S. troops from Santa Fe to Taos, together with 65 volunteers, including a few New Mexicans, organized by Ceran St. Vrain, the business partner of the brothers William and Charles Bent. Along the way, the combined forces beat back a force of some 1,500 New Mexicans and Pueblo at Santa Cruz de la Cañada and at Embudo Pass. The insurgents retreated to Taos Pueblo, where they took refuge in the thick-walled adobe church. During the ensuing battle, the U.S. breached a wall of the church and directed cannon fire into the interior, inflicting many casualties and killing about 150 rebels. They captured 400 more men after close hand-to-hand fighting. Only seven Americans died in the battle. A separate force of U.S. troops under captains Israel R. Hendley and Jesse I. Morin campaigned against the rebels in Mora. The First Battle of Mora ended in a New Mexican victory. The Americans attacked again in the Second Battle of Mora and won, which ended their operations against Mora. New Mexican rebels engaged U.S. forces three more times in the following months. The actions are known as the Battle of Red River Canyon, the Battle of Las Vegas, and the Battle of Cienega Creek. After the U.S. forces won each battle, the New Mexicans and Indians ended open warfare. Although the U.S. declared war against Mexico on May 13, 1846, it took almost three months (until early August 1846) for definitive word of Congress' declaration of war to get to California. American consul Thomas O. Larkin, stationed in Monterey, worked successfully during the events in that vicinity to avoid bloodshed between Americans and the Mexican military garrison commanded by General José Castro, the senior military officer in California. Captain John C. Frémont, leading a U.S. Army topographical expedition to survey the Great Basin, entered the Sacramento Valley in December 1845. Frémont's party was at Upper Klamath Lake, Oregon Territory, when it received word that war between Mexico and the U.S. was imminent; the party then returned to California. Mexico had issued a proclamation that unnaturalized foreigners were no longer permitted to have land in California and were subject to expulsion. With rumors swirling that General Castro was massing an army against them, American settlers in the Sacramento Valley banded together to meet the threat. On June 14, 1846, 34 American settlers seized control of the undefended Mexican government outpost of Sonoma to forestall Castro's plans. One settler created the Bear Flag and raised it over Sonoma Plaza. Within a week, 70 more volunteers joined the rebels' force, which grew to nearly 300 in early July. This event, led by William B. Ide, became known as the Bear Flag Revolt. On June 25, Frémont's party arrived to assist in an expected military confrontation. San Francisco, then called Yerba Buena, was occupied by the Bear Flaggers on July 2. On July 5 Frémont's California Battalion was formed by combining his forces with many of the rebels. Commodore John D. Sloat, commander of the U.S. Navy's Pacific Squadron, near Mazatlan, Mexico, had received orders to seize San Francisco Bay and blockade California ports when he was positive that war had begun. Sloat set sail for Monterey, reaching it on July 1. Sloat, upon hearing of the events in Sonoma and Frémont's involvement, erroneously believed Frémont to be acting on orders from Washington and ordered his forces to occupy Monterey on July 7 and raise the American flag. On July 9, 70 sailors and marines landed at Yerba Buena and raised the American flag. Later that day in Sonoma, the Bear Flag was lowered and the American flag was raised in its place. On Sloat's orders, Frémont brought 160 volunteers to Monterey, in addition to the California Battalion. On July 15, Sloat transferred his command of the Pacific Squadron to Commodore Robert F. Stockton, who was more militarily aggressive. He mustered the willing members of the California Battalion into military service with Frémont in command. Stockton ordered Frémont to San Diego to prepare to move northward to Los Angeles. As Frémont landed, Stockton's 360 men arrived in San Pedro. General Castro and Governor Pío Pico wrote farewells and fled separately to the Mexican state of Sonora. Stockton's army entered Los Angeles unopposed on August 13, whereupon he sent a report to the Secretary of State that "California is entirely free from Mexican dominion." Stockton, however, left a tyrannical officer in charge of Los Angeles with a small force. 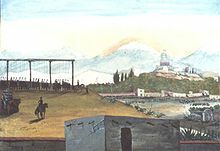 The Californios under the leadership of José María Flores, acting on their own and without federal help from Mexico, in the Siege of Los Angeles, forced the American garrison to retreat on September 29. They also forced small U.S. garrisons in San Diego and Santa Barbara to flee. Captain William Mervine landed 350 sailors and Marines at San Pedro on October 7. They were ambushed and repulsed at the Battle of Dominguez Rancho by Flores' forces in less than an hour. Four Americans died, with 8 severely injured. Stockton arrived with reinforcements at San Pedro, which increased the American forces there to 800. He and Mervine then set up a base of operations at San Diego. Meanwhile, U.S. Colonel Stephen W. Kearny and his force of about 100 men, who had performed a grueling march across New Mexico and the Sonoran Desert, crossed the Colorado River in late November, 1846. Stockton sent a 35-man patrol from San Diego to meet them. On December 7, 100 lancers under General Andrés Pico (brother of the governor), tipped off and lying in wait, fought Kearny's army of about 150 at the Battle of San Pasqual, where 22 of Kearny's men (one of whom later died of wounds), including three officers, were killed in 30 minutes of fighting. The wounded Kearny and his bloodied force pushed on until they had to establish a defensive position on "Mule Hill". However, General Pico kept the hill under siege for four days until a 215-man American relief force arrived. Frémont and the 428-man California Battalion arrived in San Luis Obispo on December 14 and Santa Barbara on December 27. On December 28, a 600-man American force under Kearny began a 150-mile march to Los Angeles. Flores then moved his ill-equipped 500-man force to a 50-foot-high bluff above the San Gabriel River. On January 8, 1847, the Stockton-Kearny army defeated the Californio force in the two-hour Battle of Rio San Gabriel. That same day, Frémont's force arrived at San Fernando. The next day, January 9, the Stockton-Kearny forces fought and won the Battle of La Mesa. On January 10, the U.S. Army entered Los Angeles to no resistance. On January 12, Frémont and two of Pico's officers agreed to terms for a surrender. Articles of Capitulation were signed on January 13 by Frémont, Andrés Pico and six others at a rancho at Cahuenga Pass (modern-day North Hollywood). This became known as the Treaty of Cahuenga, which marked the end of armed resistance in California. USS Independence assisted in the blockade of the Mexican Pacific coast, capturing the Mexican ship Correo and a launch on May 16, 1847. She supported the capture of Guaymas, Sonora, on October 19, 1847, and landed bluejackets and Marines to occupy Mazatlán, Sinaloa, on November 11, 1847. After upper California was secure, most of the Pacific Squadron proceeded down the California coast, capturing all major cities of the Baja California Territory and capturing or destroying nearly all Mexican vessels in the Gulf of California. Other ports, not on the peninsula, were taken as well. The objective of the Pacific Coast Campaign was to capture Mazatlán, on the Mexican mainland, which was a major supply base for Mexican forces. Numerous Mexican ships were also captured by this squadron, with the USS Cyane given credit for 18 ships captured and numerous destroyed. Entering the Gulf of California, Independence, Congress, and Cyane seized La Paz, then captured and burned the small Mexican fleet at Guaymas. Within a month, they cleared the Gulf of hostile ships, destroying or capturing 30 vessels. Later, their sailors and Marines captured the port of Mazatlán on November 11, 1847. A Mexican campaign under Manuel Pineda Muñoz to retake the various captured ports resulted in several small clashes (Battle of Mulege, Battle of La Paz, Battle of San José del Cabo) and two sieges (Siege of La Paz, Siege of San José del Cabo) in which the Pacific Squadron ships provided artillery support. U.S. garrisons remained in control of the ports. Following reinforcement, Lt. Col. Henry S. Burton marched out. His forces rescued captured Americans, captured Pineda, and, on March 31, defeated and dispersed remaining Mexican forces at the Skirmish of Todos Santos, unaware that the Treaty of Guadalupe Hidalgo had been signed in February 1848 and a truce agreed to on March 6. When the American garrisons were evacuated to Monterey following the treaty ratification, many Mexicans went with them: those who had supported the American cause and had thought Lower California would also be annexed along with Upper California. The Mexican Army's defeats at Palo Alto and Resaca de la Palma caused political turmoil in Mexico, turmoil which Antonio López de Santa Anna used to revive his political career and return from self-imposed exile in Cuba in mid-August 1846. It was President Polk's plan to bring back the exiled dictator who had defeated the Texans at the Alamo and Goliad. On 4 August 1846, "Polk negotiated a deal to not only bring Santa Anna back, but to pay him $2 million—ostensibly a bribe as an advance payment on the cession of California." Santa Anna promised the U.S. that if he was allowed to pass through the blockade, he would negotiate a peaceful conclusion to the war and sell the New Mexico and Alta California territories to the U.S. Once Santa Anna arrived in Mexico City, however, he reneged on his deal with the U.S. and offered his services to the Mexican government. Then, after being appointed commanding general, he reneged again and seized the presidency. Led by Zachary Taylor, 2,300 U.S. troops crossed the Rio Grande after some initial difficulties in obtaining river transport. His soldiers occupied the city of Matamoros, then Camargo (where the soldiery suffered the first of many problems with disease) and then proceeded south and besieged the city of Monterrey. The hard-fought Battle of Monterrey resulted in serious losses on both sides. The American light artillery was ineffective against the stone fortifications of the city. The Mexican forces were under General Pedro de Ampudia and repulsed Taylor's best infantry division at Fort Teneria. American soldiers, including many West Pointers, had never engaged in urban warfare before and they marched straight down the open streets, where they were annihilated by Mexican defenders well-hidden in Monterrey's thick adobe homes. Two days later, they changed their urban warfare tactics. 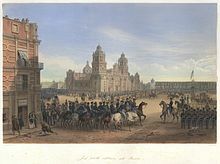 Texan soldiers had fought in a Mexican city before (the Siege of Béxar in December 1835) and advised Taylor's generals that the Americans needed to "mouse hole" through the city's homes. In other words, they needed to punch holes in the side or roofs of the homes and fight hand to hand inside the structures. Mexicans called the Texas soldiers the Diabólicos Tejanos (the Devil Texans). This method proved successful. Eventually, these actions drove and trapped Ampudia's men into the city's central plaza, where howitzer shelling forced Ampudia to negotiate. Taylor agreed to allow the Mexican Army to evacuate and to an eight-week armistice in return for the surrender of the city. Under pressure from Washington, Taylor broke the armistice and occupied the city of Saltillo, southwest of Monterrey. Santa Anna blamed the loss of Monterrey and Saltillo on Ampudia and demoted him to command a small artillery battalion. On February 22, 1847, Santa Anna personally marched north to fight Taylor with 20,000 men. Taylor, with 4,600 men, had entrenched at a mountain pass called Buena Vista. Santa Anna suffered desertions on the way north and arrived with 15,000 men in a tired state. He demanded and was refused surrender of the U.S. Army; he attacked the next morning. Santa Anna flanked the U.S. positions by sending his cavalry and some of his infantry up the steep terrain that made up one side of the pass, while a division of infantry attacked frontally along the road leading to Buena Vista. Furious fighting ensued, during which the U.S. troops were nearly routed, but managed to cling to their entrenched position, thanks to the Mississippi Rifles, a volunteer regiment led by Jefferson Davis, who formed them into a defensive V formation. The Mexicans had inflicted considerable losses but Santa Anna had gotten word of upheaval in Mexico City, so he withdrew that night, leaving Taylor in control of part of Northern Mexico. Polk mistrusted Taylor, who he felt had shown incompetence in the Battle of Monterrey by agreeing to the armistice. Taylor later used the Battle of Buena Vista as the centerpiece of his successful 1848 presidential campaign. The Bear Springs Treaty ended a large scale insurrection by the Ute, Zuni, Moquis, and Navajo tribes. After the successful conquest of New Mexico, American troops moved into modern-day northwest Mexico. On March 1, 1847, Alexander W. Doniphan occupied Chihuahua City. British consul John Potts did not want to let Doniphan search Governor Trias's mansion, and unsuccessfully asserted it was under British protection. American merchants in Chihuahua wanted the American force to stay in order to protect their business. Major William Gilpin advocated a march on Mexico City and convinced a majority of officers, but Doniphan subverted this plan. Then in late April, Taylor ordered the First Missouri Mounted Volunteers to leave Chihuahua and join him at Saltillo. The American merchants either followed or returned to Santa Fe. Along the way, the townspeople of Parras enlisted Doniphan's aid against an Indian raiding party that had taken children, horses, mules, and money. The civilian population of northern Mexico offered little resistance to the American invasion, possibly because the country had already been devastated by Comanche and Apache Indian raids. Josiah Gregg, who was with the American army in northern Mexico, said that "the whole country from New Mexico to the borders of Durango is almost entirely depopulated. The haciendas and ranchos have been mostly abandoned, and the people chiefly confined to the towns and cities." Southern Mexico had a large indigenous population and was geographically distant from the capital. Yucatán in particular had closer ties to Cuba and to the United States than it did to central Mexico. On a number of occasions in the early era of the Mexican Republic, Yucatán seceded from the federation. There were also rivalries between regional elites, with one faction based in Mérida and the other in Campeche. These issues factored into the Mexican–American War. The U.S. Navy contributed to the war by controlling the coast and clearing the way for U.S. troops and supplies, especially to Mexico's main port of Veracruz. Even before hostilities began in the disputed northern region, the U.S. Navy created a blockade. Given the shallow waters of that portion of the Gulf coast, the U.S. Navy needed ships with a shallow draft rather than large frigates. Since the Mexican Navy was almost non-existent, the U.S. Navy could operate unimpeded in Gulf waters. Commodore Matthew C. Perry led a detachment of seven vessels along the northern coast of Tabasco state. Perry arrived at the Tabasco River (now known as the Grijalva River) on October 22, 1846, and seized the town Port of Frontera along with two of their ships. Leaving a small garrison, he advanced with his troops towards the town of San Juan Bautista (Villahermosa today). Perry arrived in the city of San Juan Bautista on October 25, seizing five Mexican vessels. Colonel Juan Bautista Traconis, Tabasco Departmental commander at that time, set up barricades inside the buildings. Perry realized that the bombing of the city would be the only option to drive out the Mexican Army, and to avoid damage to the merchants of the city, withdrew its forces preparing them for the next day. On June 16, Perry arrived at San Juan Bautista and commenced bombing the city. The attack included two ships that sailed past the fort and began shelling it from the rear. David D. Porter led 60 sailors ashore and seized the fort, raising the American flag over the works. Perry and the landing force arrived and took control of the city around 14:00. The U.S. was concerned with the extension of British power in the Caribbean, especially Spanish Cuba, as well as the strategic Yucatán peninsula. In 1847 Maya revolted against the white elites of the peninsula in a racial war known as the Caste War of Yucatan. Jefferson Davis, then a senator from Mississippi, argued in congress that the president needed no further powers to intervene in Yucatan since the war with Mexico was underway. Davis's concern was strategic and part of his vision of Manifest Destiny, considering the Gulf of Mexico "a basin of water belonging to the United States" and continuing "the cape of Yucatan and the island of Cuba must be ours" rather than under British influence. In the end, the U.S. did not intervene in Yucatán, but it had figured in congressional debates about the Mexican–American War. At one point, the government of Yucatán petitioned the U.S. for protection during the Caste War, but the U.S. did not respond. The desertion rate in the U.S. Army was 8.3% (9,200 out of 111,000), compared to 12.7% during the War of 1812 and usual peacetime rates of about 14.8% per year. Many men deserted to join another U.S. unit and get a second enlistment bonus. Some deserted because of the miserable conditions in camp. It has been suggested that others used the army to get free transportation to California, where they deserted to join the gold rush; this, however, is unlikely as gold was only discovered in California on January 24, 1848, less than two weeks before the war concluded. [original research?] By the time word reached the eastern U.S. that gold had been discovered, word also reached it that the war was over. Several hundred U.S. deserters went over to the Mexican side. Nearly all were recent immigrants from Europe with weak ties to the U.S. The Mexicans issued broadsides and leaflets enticing U.S. soldiers with promises of money, land bounties, and officers' commissions. Mexican guerrillas shadowed the U.S. Army and captured men who took unauthorized leave or fell out of the ranks. The guerrillas coerced these men to join the Mexican ranks. The generous promises proved illusory for most deserters, who risked being executed if captured by U.S. forces. The most famous group of deserters from the U. S. Army, was the Saint Patrick's Battalion or (San Patricios), composed primarily of several hundred immigrant soldiers, the majority Catholic Irish and German immigrants, who deserted the U.S. Army because of ill-treatment or sympathetic leanings to fellow Mexican Catholics and joined the Mexican army. The battalion also included Canadians, English, French, Italians, Poles, Scots, Spaniards, Swiss, and Mexican people, many of whom were members of the Catholic Church. 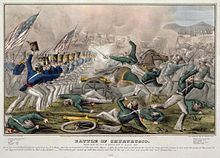 Most of the battalion were killed in the Battle of Churubusco; about 100 were captured by the U.S. and roughly half of the San Patricios were tried and were hanged as deserters following their capture at Churubusco in August 1847. The leader, Jon Riley, was merely branded since he had deserted before the war started. Rather than reinforce Taylor's army for a continued advance, President Polk sent a second army under General Winfield Scott, which was transported to the port of Veracruz by sea, to begin an invasion of the Mexican heartland. On March 9, 1847, Scott performed the first major amphibious landing in U.S. history in preparation for the Siege of Veracruz. A group of 12,000 volunteer and regular soldiers successfully offloaded supplies, weapons, and horses near the walled city using specially designed landing crafts. Included in the invading force were Robert E. Lee, George Meade, Ulysses S. Grant, James Longstreet, and Thomas "Stonewall" Jackson. The city was defended by Mexican General Juan Morales with 3,400 men. Mortars and naval guns under Commodore Matthew C. Perry were used to reduce the city walls and harass defenders. After a bombardment on March 24, 1847, the walls of Veracruz had a thirty-foot gap. The city replied the best it could with its own artillery. The effect of the extended barrage destroyed the will of the Mexican side to fight against a numerically superior force, and they surrendered the city after 12 days under siege. U.S. troops suffered 80 casualties, while the Mexican side had around 180 killed and wounded, about half of whom were civilian. During the siege, the U.S. side began to fall victim to yellow fever. 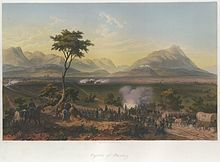 Scott then marched westward on April 2, 1847, toward Mexico City with 8,500 healthy troops, while Santa Anna set up a defensive position in a canyon around the main road about 50 miles (80 km) north-west of Veracruz, near the hamlet of Cerro Gordo. Santa Anna had entrenched with 12,000 troops, and artillery that were trained on the road, where he expected Scott to appear. However, Scott had sent 2,600 mounted dragoons ahead and they reached the pass on April 12. The Mexican artillery prematurely fired on them and therefore revealed their positions, beginning the Battle of Cerro Gordo. In May, Scott pushed on to Puebla, the second largest city in Mexico. Because of the citizens' hostility to Santa Anna, the city capitulated without resistance on May 1. During the following months, Scott gathered supplies and reinforcements at Puebla and sent back units whose enlistments had expired. Scott also made strong efforts to keep his troops disciplined and treat the Mexican people under occupation justly, so as to prevent a popular rising against his army. With guerrillas harassing his line of communications back to Veracruz, Scott decided not to weaken his army to defend Puebla but, leaving only a garrison at Puebla to protect the sick and injured recovering there, advanced on Mexico City on August 7 with his remaining force. 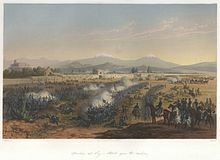 The capital was laid open in a series of battles around the right flank of the city defenses, the Battle of Contreras and Battle of Churubusco. After Churubusco, fighting halted for an armistice and peace negotiations, which broke down on September 6, 1847. With the subsequent battles of Molino del Rey and of Chapultepec, and the storming of the city gates, the capital was occupied. Scott became military governor of occupied Mexico City. His victories in this campaign made him an American national hero. The Battle of Chapultepec was an encounter between the Mexican Army and the United States on the castle of Chapultepec in Mexico City. At this time, this castle was a renowned military school in Mexico City. After the battle, which ended in an American victory, the legend of "Los Niños Héroes" was born. Although not confirmed by historians, six military cadets between the ages of 13 and 17 stayed in the school instead of evacuating. They decided to stay and fight for Mexico. These Niños Héroes (hero children) became icons in Mexico's pantheon of heroes. Rather than surrender to the U.S. Army, some military cadets leaped from the castle walls. A cadet named Juan Escutia wrapped himself in the Mexican flag and jumped to his death. In late September 1847, Santa Anna made one last attempt to defeat the Americans, by cutting them off from the coast. General Joaquín Rea began the Siege of Puebla, soon joined by Santa Anna, but they failed to take it before the approach of a relief column from Veracruz under Brig. Gen. Joseph Lane prompted Santa Anna to stop him. Puebla was relieved by Gen. Lane October 12, 1847, following his defeat of Santa Anna at the Battle of Huamantla on October 9, 1847. The battle was Santa Anna's last. Following the defeat, the new Mexican government led by Manuel de la Peña y Peña asked Santa Anna to turn over command of the army to General José Joaquín de Herrera. Following his capture and securing of the capital, General Scott sent about a quarter of his strength to secure his line of communications to Veracruz from the Light Corps of General Joaquín Rea and other Mexican guerrilla forces that had been harassing it since May. He strengthened the garrison of Puebla and by November had added a 1200-man garrison at Jalapa, established 750-man posts along the National Road, the main route between the port of Veracruz and the capital, at the pass between Mexico City and Puebla at Rio Frio, at Perote and San Juan on the road between Jalapa and Puebla, and at Puente Nacional between Jalapa and Veracruz. He had also detailed an anti guerrilla brigade under Brig. Gen. Joseph Lane to carry the war to the Light Corps and other guerrillas. He ordered that convoys would travel with at least 1,300-man escorts. Victories by General Lane over the Light Corps at Atlixco (October 18, 1847), at Izucar de Matamoros (November 23, 1847), and at Galaxara Pass (November 24, 1847) ended the threat of General Rea. Later a raid against the guerrillas of Padre Jarauta at Zacualtipan (February 25, 1848) further reduced guerrilla raids on the American line of communications. After the two governments concluded a truce to await ratification of the peace treaty, on March 6, 1848, formal hostilities ceased. However some bands continued in defiance of the Mexican government until the American evacuation in August. Some were suppressed by the Mexican Army or, like Padre Jarauta, executed. Outnumbered militarily and with many of its large cities occupied, Mexico could not defend itself; the country was also faced with many internal divisions, including the Caste War of Yucatán. The Treaty of Guadalupe Hidalgo, signed on February 2, 1848, by American diplomat Nicholas Trist and Mexican plenipotentiary representatives Luis G. Cuevas, Bernardo Couto, and Miguel Atristain, ended the war. The treaty gave the U.S. undisputed control of Texas, established the U.S.-Mexican border of the Rio Grande, and ceded to the United States the present-day states of California, Nevada, and Utah, most of New Mexico, Arizona and Colorado, and parts of Texas, Oklahoma, Kansas, and Wyoming. In return, Mexico received $15 million ($434 million today) – less than half the amount the U.S. had attempted to offer Mexico for the land before the opening of hostilities – and the U.S. agreed to assume $3.25 million ($94 million today) in debts that the Mexican government owed to U.S. citizens. The treaty was ratified by the U.S. Senate by a vote of 38 to 14 on March 10, and by Mexico through a legislative vote of 51–34 and a Senate vote of 33–4, on May 19. News that New Mexico's legislative assembly had passed an act for organization of a U.S. territorial government helped ease Mexican concern about abandoning the people of New Mexico. The acquisition was a source of controversy, especially among U.S. politicians who had opposed the war from the start. A leading antiwar U.S. newspaper, the Whig National Intelligencer, sardonically concluded that "We take nothing by conquest ... Thank God." Jefferson Davis introduced an amendment giving the U.S. most of northeastern Mexico, which failed 44–11. This amendment was supported by both senators from Texas (Sam Houston and Thomas Jefferson Rusk), Daniel S. Dickinson of New York, Stephen A. Douglas of Illinois, Edward A. Hannegan of Indiana, and one each from Alabama, Florida, Mississippi, Ohio, Missouri, and Tennessee. Most of the leaders of the Democratic party – Thomas Hart Benton, John C. Calhoun, Herschel V. Johnson, Lewis Cass, James Murray Mason of Virginia, and Ambrose Hundley Sevier – were opposed. An amendment by Whig Senator George Edmund Badger of North Carolina to exclude New Mexico and Upper California lost 35–15, with three Southern Whigs voting with the Democrats. Daniel Webster was bitter that four New England senators made deciding votes for acquiring the new territories. The acquired lands west of the Rio Grande are traditionally called the Mexican Cession in the U.S., as opposed to the Texas Annexation two years earlier, though division of New Mexico down the middle at the Rio Grande never had any basis either in control or Mexican boundaries. Mexico never recognized the independence of Texas before the war, and did not cede its claim to territory north of the Rio Grande or Gila River until this treaty. Before ratifying the treaty, the U.S. Senate made two modifications: changing the wording of Article IX (which guaranteed Mexicans living in the purchased territories the right to become U.S. citizens) and striking out Article X (which conceded the legitimacy of land grants made by the Mexican government). On May 26, 1848, when the two countries exchanged ratifications of the treaty of Guadalupe Hidalgo, they further agreed to a three-article protocol (known as the Protocol of Querétaro) to explain the amendments. The first article claimed that the original Article IX of the treaty, although replaced by Article III of the Treaty of Louisiana, would still confer the rights delineated in Article IX. The second article confirmed the legitimacy of land grants under Mexican law. The protocol was signed in the city of Querétaro by A. H. Sevier, Nathan Clifford, and Luis de la Rosa. The 1848 Treaty of Guadalupe Hidalgo ended the war and enforced the Mexican Cession of the northern territories of Alta California and Santa Fe de Nuevo México to the United States. Mexico acknowledged the loss of what became the State of Texas and accepted the Rio Grande as its northern border with the U.S. The losses amounted to one-third of its original territory from its 1821 independence. Before the secession of Texas, Mexico comprised almost 1,700,000 sq mi (4,400,000 km2), but by 1849 it was just under 800,000 square miles (2,100,000 km2). Another 30,000 square miles (78,000 km2) were sold to the U.S. in the Gadsden Purchase of 1853, so the total reduction of Mexican territory was more than 55%, or 900,000 square miles (2,300,000 km2). Though the annexed territory was about the size of Western Europe, it was sparsely populated. The land contained about 14,000 non-indigenous people in Alta California and about 60,000 in Nuevo México, as well as large Indian nations, such as the Papago, Pima, Puebloan, Navajo, Apache and many others. Although some native people relocated farther south in Mexico, the great majority remained in the U.S. territory. The American settlers surging into the newly conquered Southwest were openly contemptuous of Mexican law (a civil law system based on the law of Spain) as alien and inferior and disposed of it by enacting reception statutes at the first available opportunity. However, they recognized the value of a few aspects of Mexican law and carried them over into their new legal systems. For example, most of the southwestern states adopted community property marital property systems, as well as water law. Mexicans and Indians in the annexed territories faced a loss of civil and political rights, even though the Treaty of Guadalupe Hidalgo promised American citizenship to all Mexican citizens living in the territory of the Mexican Cession. The U.S. government withheld citizenship from Indians in the southwest until the 1930s, although they were citizens under Mexican law. In much of the United States of America, victory and the acquisition of new land brought a surge of patriotism. Victory seemed to fulfill Democrats' belief in their country's Manifest Destiny. While Whig Ralph Waldo Emerson rejected war "as a means of achieving America's destiny," he accepted that "most of the great results of history are brought about by discreditable means." Although the Whigs had opposed the war, they made Zachary Taylor their presidential candidate in the election of 1848, praising his military performance while muting their criticism of the war. A month before the end of the war, Polk was criticized in a United States House of Representatives amendment to a bill praising Major General Zachary Taylor for "a war unnecessarily and unconstitutionally begun by the President of the United States." This criticism, in which Congressman Abraham Lincoln played an important role with his Spot Resolutions, followed congressional scrutiny of the war's beginnings, including factual challenges to claims made by President Polk. The vote followed party lines, with all Whigs supporting the amendment. 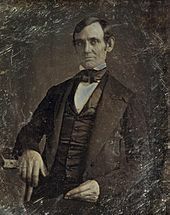 Lincoln's attack won lukewarm support from fellow Whigs in Illinois but was harshly counter-attacked by Democrats, who rallied pro-war sentiments in Illinois; Lincoln's Spot resolutions haunted his future campaigns in the heavily Democratic state of Illinois, and were cited by enemies well into his presidency. Many of the military leaders on both sides of the American Civil War were trained at the U.S. Military Academy at West Point and had fought as junior officers in Mexico. This list includes military men fighting for the Union: Ulysses S. Grant, George B. McClellan, William T. Sherman, George Meade, and Ambrose Burnside. Military men who joined the Southern secessionists of the Confederate States of America were Robert E. Lee, Stonewall Jackson, James Longstreet, Joseph E. Johnston, Braxton Bragg, Sterling Price, and the future Confederate President Jefferson Davis. Both sides had leaders with significant experience in active combat in strategy and tactics, likely shaping ways the Civil War conflict played out. This view was shared by the philosopher Ralph Waldo Emerson, who towards the end of the war wrote that "The United States will conquer Mexico, but it will be as the man swallows the arsenic, which brings him down in turn. Mexico will poison us." Veterans of the war were often broken men. "As the sick and wounded from Taylor's and Scott's campaigns made their way back from Mexico to the United States, their condition shocked the folks at home. Husbands, sons, and brothers returned in broken health, some with missing limbs." 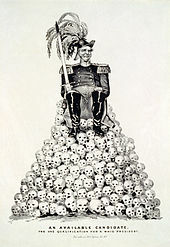 As late as 1880, the "Republican Campaign Textbook" by the Republican Congressional Committee described the war as "Feculent, reeking Corruption" and "one of the darkest scenes in our history—a war forced upon our and the Mexican people by the high-handed usurpations of Pres't Polk in pursuit of territorial aggrandizement of the slave oligarchy." General Robert E. Lee, leader of the Confederate forces through the end of the American Civil War, began building his reputation as a military officer in America's war against Mexico. At the start of the Mexican–American War, Captain Lee invaded Mexico with General Wool's engineering department from the North. By early 1847, he helped take the Mexican cities of Vera Cruz, Cerro Gordo, Contreras, Churubusco, Molino del Rey, and Chapultepec. Lee was wounded in Chapultepec. By September, Mexico City surrendered and the United States was victorious. "An Available Candidate: The One Qualification for a Whig President." Political cartoon about the 1848 presidential election, referring to Zachary Taylor or Winfield Scott, the two leading contenders for the Whig Party nomination in the aftermath of the Mexican–American War. Published by Nathaniel Currier in 1848, digitally restored. General Scott was the ranking officer in the army during the Mexican–American campaign. He described Robert E. Lee as "gallant and indefatigable," saying that Lee had displayed the "greatest feat of physical and moral courage performed by any individual in [his] knowledge during the campaign." Robert E. Lee's humility and professionalism was apparent early on in his career when gave credit to General Scott for the victories. He said that "It was his stout heart ... his bold self reliance ... his indomitable courage that ... ressed us forward to this capital." It is important to note that although Lee is remembered for his valor during the Mexican–American War, he was only a junior officer "who had never commanded a regiment in the field". In 1861, it was General Scott who advised Abraham Lincoln to ask Lee to command the union forces. Lee declined, and later recounted "I declined the offer he made me to take command of the army that was brought into the field, stating candidly and as courteously as I could that though opposed to secession and deprecating war, I could take no part in the invasion of the southern states." On April 9, 1865, it was General Robert E. Lee who had surrendered to President Lincoln's Union Forces. Despite initial objections from the Whigs and abolitionists, the war nevertheless united the U.S. in a common cause and was fought almost entirely by volunteers. The army swelled from just over 6,000 to more than 115,000. The majority of 12-month volunteers in Scott's army decided that a year's fighting was enough and returned to the U.S.
Anti-slavery elements fought for the exclusion of slavery from any territory absorbed by the U.S. In 1847, the House of Representatives passed the Wilmot Proviso, stipulating that none of the territory acquired should be open to slavery. The Senate avoided the issue, and a late attempt to add it to the Treaty of Guadalupe Hidalgo was defeated. The military defeat and loss of territory was a disastrous blow to Mexico, causing the country to enter "a period of self-examination ... as its leaders sought to identify and address the reasons that had led to such a debacle." In the immediate aftermath of the war, a group of prominent Mexicans compiled an assessment of the reasons for the war and Mexico's defeat, edited by Ramón Alcaraz and including contributions by Ignacio Ramírez, Guillermo Prieto, José María Iglesias, and Francisco Urquidi. They wrote that for "the true origin of the war, it is sufficient to say that the insatiable ambition of the United States, favored by our weakness, caused it." The work was translated to English by Colonel Albert Ramsey, a veteran of the Mexican–American War, and published in 1850. The war remains a painful historical event for the country. ^ Variations include U.S.–Mexican War, the U.S.–Mexico War. ^ Spanish: Intervención americana en México, or Intervención estadounidense en México. In Mexico, it may also be called the War of United States-Mexico (Guerra de Estados Unidos-México). ^ a b c d e f g Clodfelter 2017, p. 249. ^ White, Ronald Cedric (2017). American Ulysses: a life of Ulysses S. Grant (Random House trade paperback ed.). New York: Random House. p. 96. ISBN 9780812981254. OCLC 988947112. The Mexican War of 1846-1848, largely forgotten today, was the second costliest war in American history in terms of the percentage of soldiers who died. Of the 78, 718 American soldiers who served, 13,283 died, constituting a casualty rate of 16.87 percent. By comparison, the casualty rate was 2.5 percent in World War I and World War II, 0.1 percent in Korea and Vietnam, and 21 percent for the Civil War. Of the casualties, 11,562 died of illness, disease, and accidents. ^ Greenberg, Amy (2012). A Wicked War: Polk, Clay, Lincoln, and the 1846 U.S. Invasion of Mexico. Vintage. p. 33. ISBN 978-0-307-47599-2. ^ Rives 1913, p. 658. ^ a b Davis, Kenneth C. (1995). Don't Know Much About History. New York: Avon Books. p. 143. ^ a b Zinn, Howard (2003). "Chapter 8: We take nothing by conquest, Thank God". A People's History of the United States. New York: HarperCollins Publishers. p. 169. ^ a b Alcaraz, et al. The Other Side, pp. 1–2. ^ Ramón Alcaraz, et al. The Other Side or Notes for the History of the War between Mexico and the United States. New York: Burt Franklin 1850, republished 1970, 1–2. ^ DeLay, Brian (Feb 2007), "Independent Indians and the U.S. Mexican War," The American Historical Review, Vol. 112, No. 2, p. 35. ^ DeLay, Brian (2008), The War of a Thousand Deserts, New Haven: Yale University Press, p. 286. ^ "The Borderlands on the Eve of War". The U.S.-Mexican War. PBS. ^ "The Annexation of Texas" U.S. Department of State, Retrieved July 6, 2012. ^ Rives 1913, p. 45–46. ^ Rives 1913, p. 48–49. ^ Groom, Winston "Kearny's March" Alfred A. Knopf, 2011, p. 46. ^ a b Santoni, "U.S.-Mexican War", p. 1511. ^ Jesús F. de la Teja, "Texas Secession" in Encyclopedia of Mexico, Chicago: Fitzroy Dearborn 1997, 1403–04. ^ Douglas W. Richmond, "Vicente Guerrero" in Encyclopedia of Mexico, Chicago: Fitzroy Dearborn 1997, p. 617. ^ a b Rives 1913, pp. 165–168. ^ Rives 1913, pp. 172–173. ^ Mary Lee Spence, and Donald Jackson, The Expeditions of John Charles Fremont: The Bear Flag Revolt and the Court-Martial. U of Illinois Press, 1973. ^ Smith (1919), p. xi. ^ Donald Fithian Stevens, Origins of Instability in Early Republican Mexico (1991), p. 11. ^ Miguel E. Soto, "The Monarchist Conspiracy and the Mexican War" in Essays on the Mexican War ed by Wayne Cutler; Texas A&M University Press. 1986. pp. 66–67. ^ a b Brooks (1849), pp. 61–62. ^ Mexican War from Global Security.com. ^ Christon I. Archer, "Military: 1821–1914" in Encyclopedia of Mexico, Chicago: Fitzroy Dearborn 1997, 905. ^ Archer, "Military, 1821–1914", pp. 906–907. ^ "The End of the Mexican American War: The Signing of the Treaty of Guadalupe Hidalgo". Memoria Política de México (Political History of Mexico) (in Spanish). Retrieved April 22, 2015. ^ quoted in Carol and thomas Christensen, The U.S.-Mexican War. Companion to the Public Television Series, The U.S.-Mexican War, 1846–48. San Francisco: Bay Books 1998, p. 138. ^ Alamán paraphrased in Christensen, The U.S.-Mexican War, p. 61. ^ Mexican soldier Manuel Balontín, quoted in Christensen, The U.S.-Mexican War, p. 137. ^ Chartrand, Rene (March 25, 2004). René Chartrand, Santa Anna's Mexican Army 1821–48, Illustrated by Bill Younghusband, Osprey Publishing, 2004, ISBN 1-84176-667-4, ISBN 978-1-84176-667-6. ISBN 9781841766676. Retrieved May 28, 2011. ^ Meed, Douglas (2003). The Mexican War, 1846–1848. Routledge. p. 67. ^ Personal Memoirs of U. S. Grant, p. 65. ^ Acuña, Rodolfo (2015). Occupied America A History of Chicanos. Pearson. p. 50. ^ Missionaries of Republicanism: A Religious History of the Mexican-American War By John C. Pinheiro, p. 96. ^ Santa Anna of Mexico, By Will Fowler, p. 265. ^ William Hugh Robarts, "Mexican War veterans : a complete roster of the regular and volunteer troops in the war between the United States and Mexico, from 1846 to 1848; the volunteers are arranged by states, alphabetically", BRENTANO'S (A. S. WITHERBEE & CO, Proprietors); WASHINGTON, D. C., 1887. Washington, D.C. : Brentano's. March 10, 2001. Retrieved May 28, 2011. ^ Robarts, "Mexican War veterans", pp. 1–24. ^ Robarts, "Mexican War veterans", pp. 39–79. ^ Personal Memoirs of U. S. Grant, Complete. June 2004. ^ Bronwyn Mills. U.S.-Mexican War ISBN 0-8160-4932-7. ^ Spencer Tucker. U.S. Leadership in Wartime: Clashes, Controversy, and Compromise, Volume 1, p. 249. ^ David Montejano (1987). Anglos and Mexicans in the Making of Texas, 1836–1986. University of Texas Press. p. 30. ISBN 9780292788077. ^ Justin Harvey Smith (1919). The war with Mexico vol. 1. Macmillan. p. 464. ^ K. Jack Bauer (1993). Zachary Taylor: Soldier, Planter, Statesman of the Old Southwest. Louisiana State University Press. p. 149. ISBN 9780807118511. ^ PERSONAL MEMOIRS U. S. GRANT, COMPLETE. www.gutenberg.org. June 2004. Retrieved February 25, 2016. ^ a b c d Brooks (1849), p. 122. ^ Brooks (1849), pp. 91, 117. ^ Brooks (1849), p. 121. ^ Morgan, Robert "Lions of the West" Algonquin Books of Chapel Hill, 2011, p. 237. ^ a b Tucker (2013), p. 718. ^ Smith (1919), p. 279. ^ Faragher, John Mack, et al., eds. Out Of Many: A History of the American People. Upper Saddle River: Pearson Education, 2006. ^ "Message of President Polk, May 11, 1846". Archived from the original on July 25, 2008. Retrieved July 20, 2008. Mexico has passed the boundary of the United States, has invaded our territory and shed American blood upon the American soil. She has proclaimed that hostilities have commenced, and that the two nations are now at war. ^ a b Bauer (1992), p. 68. ^ Jay (1853), pp. 165–166. ^ Jay (1853), p. 165. ^ See O'Sullivan's 1845 article "Annexation", United States Magazine and Democratic Review. ^ quoted in Christensen, The U.S.-Mexican War, p. 74. ^ Giddings, Joshua Reed. Speeches in Congress [1841–1852], J.P. Jewett and Company, 1853, p. 17. ^ . In the Senate, February 11, 1847. ^ Sjursen, Danny (August 18, 2018). "The Fraudulent Mexican-American War (1846–48)". Truthdig. Retrieved August 31, 2018. ^ "James K. Polk: Third Annual Message—December 7, 1847". Presidency.ucsb.edu. Retrieved May 28, 2011. ^ Lawrence Delbert Cress, "Introduction", Dispatches from the Mexican War, Norman: University of Oklahoma Press 1999, p. 8. ^ George Wilkins Kendall, Dispatches from the Mexican War, edited by Larence Delbert Cress. Norman: University of Oklahoma Press 1999. ^ Streetby, Shellby (2001). "American Sensations: Empire, Amnesia, and the US-Mexican War". American Literary History. 13:1: 2. ^ Ron Tyler. "A Great American Book: The War between the United States and Mexico, Illustrated" in Artes de México. No. 80, "Carl Nebel: Nineteenth-Century Itinerant Painter", August 2006, pp. 77–80. ^ a b "The Battle of Santa Fe". Early American Wars: A Guide to Early American Units and Battles before 1865. MyCivilWar.com. 2005–2008. Retrieved January 14, 2009. ^ a b Simmons, Marc (1973). The Little Lion of the Southwest: a life of Manuel Antonio Chaves. Chicago: The Swallow Press. ISBN 978-0-8040-0633-0. ^ "New Mexico Historic Markers: Canoncito at Apache Canyon". Archived from the original on September 27, 2007. Retrieved April 15, 2007. Includes a link to a map. ^ Keleher, William A. (1952). Turmoil in New Mexico 1846–1848. University of New Mexico Press. ISBN 978-0-8263-0631-9. ^ Beck, Warren A. (1962). New Mexico: A History of Four Centuries. University of Oklahoma Press. ^ Morgan, Robert (2011). Lions of the West. Algonquin Books of Chapel Hill, p. 243. ^ Garrard, Lewis H. (1850). Wah-to-yah and the Taos Trail; or Prairie Travel and Scalp Dances, with a Look at Los Rancheros from Muleback and the Rocky Mountain Camp-fire, pp. 214–215; reprint, University of Oklahoma Press, Norman, 1955. ^ Walker, Dale L. (1999). Bear Flag Rising: The Conquest of California, 1846. New York: Macmillan. p. 104. ISBN 978-0312866853. ^ Walker, pp. 91–92, 96. ^ a b Walker, p. 154. ^ Brooks (1849), p. 257. ^ Bauer (1992), pp. 190–191. ^ a b c Walker, p. 246. ^ Bauer (1992), p. 201. ^ Schweikart, Larry; Allen, Michael (2004). A Patriot's History of the United States: From Columbus's Great Discovery to the War on Terror. Sentinel HC. p. 242. ISBN 978-1595230010. ^ Rives 1913, p. 233. ^ a b "Urban Warfare". Battle of Monterrey.com. Archived from the original on July 7, 2011. Retrieved May 28, 2011. ^ Rip Ford's Texas Memoirs, Stephen Oates, University of Texas Press, 1963. ^ Dishman, Christopher (2010). A Perfect Gibraltar: The Battle for Monterrey, Mexico. University of Oklahoma Press. ISBN 978-0-8061-4140-4. ^ Shelby Foote, The Civil War: A Narrative: Volume 1: Fort Sumter to Perryville (1958). ^ Groom, Winston "Kearny's March" Alfred A. Knopf, 2011, p. 143. ^ Roger D. Launius (1997). Alexander William Doniphan: portrait of a Missouri moderate. University of Missouri Press. ISBN 978-0-8262-1132-3. ^ Hamalainen, Pekka. The Comanche Empire. New Haven: Yale University Press. p. 232. ^ Gilbert M. Joseph, "The United States, Feuding Elites, and Rural Revolt in Yucatán, 1836–1915" in Rural Revolt in Mexico: U.S. Intervention and the Domain of Subaltern Politics, expanded edition, Daniel Nugent, ed. Durham: Duke University Press 1998 pp. 173–206. ^ K. Jack Bauer, The Mexican war, 1846–1848. 1974. Republished by University of Nebraska Press 1992, pp. 108–109. ^ quoted in Brian Loveman, No Higher Law: American Foreign Policy and the Western Hemisphere Since 1776. Chapel Hill: University of North Carolina Press 2010, p. 70. ^ "Message from the President of the United States with communications from the government of Yucatan, representing the state of suffering to which that country is reduced by an insurrection of the Indians, imploring the protection of the United States, and offering, in case it should be granted, to transfer the dominion and sovereignty of the peninsula to the United States." United States. Congress. Senate. April 29, 1848. Read, referred to the Committee on Foreign Relations, and ordered to be printed. [Washington, D.C.] 19 pages, 30th Congress, 1st session. Senate. Ex. Doc. No. 40. ^ McAllister, Brian. "see Coffman, Old Army (1988), p. 193". Retrieved May 28, 2011. ^ a b Foos, Paul (2002). A Short, Offhand, Killing Affair. pp. 25, 103–7. ^ Miller, Robert Ryal (1989). Shamrock and Sword, The Saint Patrick's Battalion in the US—Mexican War. Norman, Oklahoma: University of Oklahoma Press. pp. 188–192. ISBN 978-0-8061-2964-8. ^ Morgan, Robert, Lions of the West, Algonquin Books of Chapel Hill, 2011, p. 282. ^ Eisenhower, John S. D. (1989). So Far from God: The U.S. War With Mexico, 1846–1848. New York: Random House. p. 295. ISBN 978-0-8061-3279-2. ^ a b Diseño Web y Desarrollo de Aplicaciones por Webtopia, Retrieved May 8, 2014. ^ Kirkwood, Burton (2000). The History of Mexico. pp. 97, 98, 99. ISBN 9780313303517. ^ Executive Document, No. 60, House of Representatives, first Session of the thirtieth Congress, pp. 1028, 1032. ^ Celedonio Domeco de Jarauta from es.wikipedia.org accessed June 5, 2013. ^ "Memoria Política de México". ^ Smith (1919), p. 241. ^ Mills, Bronwyn. U.S.-Mexican War. p. 23. ISBN 978-0-8160-4932-5. ^ Jay (1853), p. 117. ^ Rives 1913, pp. 634–636. ^ Frazier, Donald S. "Boundary Disputes". US-Mexican War, 1846–1848. PBS. ^ a b "Treaty of Peace, Friendship, Limits, and Settlement Between the United States of America and the United Mexican States Concluded at Guadalupe Hidalgoa". Treaty of Guadalupe Hidalgo. University of Dayton (academic.udayton.edu). Retrieved October 25, 2007. ^ "Article IX". Treaty of Guadalupe Hidalgo; February 2, 1848. Lillian Goldman Law Library. ^ DeLay, Brian (2008). War of a thousand deserts: Indian raids and the U.S.-Mexican War. New Haven: Yale University Press. p. 302. ^ "Gadsden Purchase Treaty : December 30, 1853". Lillian Goldman Law Library. ^ "Treaty of Guadalupe Hidalgo". www.ourdocuments.gov. Retrieved June 27, 2007. ^ Griswold el Castillo, Richard War's End: Treaty of Guadalupe Hidalgo" PBS, 2006. ^ Emerson, Ralph Waldo (1860). The Conduct of Life. p. 110. ISBN 978-1-4191-5736-3. ^ Linscott, 1959, pp. 218–219. ^ "Congressional Globe, 30th Session (1848)". Memory.loc.gov. pp. 93–95. Retrieved May 28, 2011. ^ "House Journal, 30th Session (1848), pp. 183–184/". Memory.loc.gov. Retrieved May 28, 2011. ^ Donald, David Herbert (1995). Lincoln. pp. 124, 128, 133. 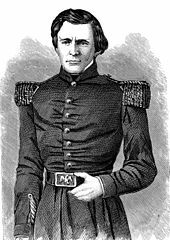 ^ "Ulysses S Grant Quotes on the Military Academy and the Mexican War". Fadedgiant.net. Retrieved May 28, 2011. ^ Personal Memoirs of General U. S. Grant — Complete by Ulysses S. Grant. Project Gutenberg Literary Archive Foundation. June 2004. Archived from the original on January 15, 2006. ^ Groom, Winston "Kearny's March" Alfred A. Knopf, 2011, pp. 275. ^ Christensen, The U.S.-Mexican War, p. 190. ^ Mexican–American War description from the Republican Campaign Textbook. ^ a b c Winston, Robert (1934). Robert E. Lee; a Biography. New York: W. Morrow & Co. p. 84. ISBN 9780313384370. ^ Sneiderman, Barney (2006). Warriors Seven: Seven American Commanders, Seven Wars, and the Irony of Battle. New York: Savas Beatie. p. 118. ISBN 978-1932714289. ^ Holmes, Prescott (1897). The battles of the war for the union being the story of the great Civil War from the election of Abraham Lincoln to the surrender at Appomatox. Philadelphia: H. Altemus. p. 333. ^ Christensen, The U.S.-Mexican War, p. 187. ^ John Douglas Pitts Fuller (1969) . The Movement for the Acquisition of All Mexico, 1846–1848. New York: Da Capo Press. Retrieved May 28, 2011. ^ Pedro Santoni, "U.S.-Mexican War" in Encyclopedia of Mexico, Chicago: Fitzroy Dearborn 1997, p. 1511. ^ Ramón Alcaraz, et al. The Other Side: or Notes for the History of the War between Mexico and the United States. Translated by Albert C. Ramsey, Colonel of the Eleventh United States Infantry During with War with Mexico. New York: Burt Franklin 1850. Republished 1970. Bauer, Karl Jack (1992). The Mexican War: 1846–1848. University of Nebraska Press. ISBN 978-0-8032-6107-5. Smith, Justin Harvey. The War with Mexico, Vol 2. (1919). full text online. DeLay, Brian. War of a Thousand Deserts: Indian Raids and the Mexican-American War. New Haven: Yale University Press 2009. Johnson, Timothy D. A Gallant Little Army: The Mexico City Campaign. Lawrence: University of Kansas Press 2007. Levinson, Irving. Wars within War: Mexican Guerrillas, Domestic Elites and the United States of America 1846–1848. Fort Worth: Texas Christian University Press 2005. Lewis, Felice Flannery. Trailing Clouds of Glory: Zachary Taylor's Mexican War Campaign and His Emerging Civil War Leaders. Tuscaloosa: University of Alabama Press 2010. Murphy, Douglas. Two Armies on the Rio Grande: The First Campaign of the U.S. MexicanWar (College Station: Texas A&M Press 2015. Beveridge, Albert J. Abraham Lincoln, 1809–1858. Volume: 1. 1928. Gleijeses, Piero. "A Brush with Mexico" Diplomatic History 2005 29(2): 223–254. ISSN 0145-2096 debates in Washington before war. Greenberg, Amy. A Wicked War: Polk, Clay, Lincoln and the 1846 Invasion of Mexico. New York: Knopf 2012. Mayers, David; Fernández Bravo, Sergio A., "La Guerra Con Mexico Y Los Disidentes Estadunidenses, 1846–1848" [The War with Mexico and US Dissenters, 1846–48]. Secuencia [Mexico] 2004 (59): 32–70. ISSN 0186-0348. Reilly, Tom. War with Mexico! America's Reporters Cover the Battlefront. Lawrence: University of Kansas Press 2010. Rodríguez Díaz, María Del Rosario. "Mexico's Vision of Manifest Destiny During the 1847 War" Journal of Popular Culture 2001 35(2): 41–50. ISSN 0022-3840. Santoni, Pedro. Mexicans at Arms: Puro Federalists and the Politics of War, 1845–1848. Fort Worth: Texas Christian Press 1996. Johannsen, Robert. To the Halls of Montezuma: The Mexican War in the American Imagination. New York: Oxford University Press 1985. Van Wagenen, Michael. Remembering the Forgotten War: The Enduring Legacies of the U.S.-Mexican War. Amherst: University of Massachusetts Press 2012. Coulter, Richard. Volunteers: The Mexican War Journals of Private Richard Coulter and Sargeant Thomas Barclay, ed. Allan Peskin. Kent: Kent State University Press 1991. Dana, Napoleon Jackson Tecumseh (1990). Ferrell, Robert H. (ed.). Monterrey Is Ours! : The Mexican War Letters of Lieutenant Dana, 1845–1847. University Press of Kentucky. ISBN 978-0813117034. LCCN 89029351. Grant, Ulysses S. (1885). Personal Memoirs of U. S. Grant. New York: Charles L. Webster & Co.
Kendall, George Wilkins (1999). Lawrence Dilbert Cress (ed.). Dispatches from the Mexican War. Norman, Oklahoma: University of Oklahoma Press. Laidley, Theodore. Surrounded by Dangers of All Kinds: The Mexican War Letter of Lieutenant Theodore Laidley. Denton: University of North Texas 1997. McClellan, George. The Mexican War Diary and Correspondence of George B. McClellan. ed. Thomas Cutrer. Baton Rouge: Louisiana State University Press 2009. Smith, Franklin (1991). Joseph E. Chance (ed.). The Mexican War Journal of Captain Franklin Smith. Jackson, Mississippi: University Press of Mississippi. George Winston Smith and Charles Judah, ed. (1968). Chronicles of the Gringos: The U.S. Army in the Mexican War, 1846–1848, Accounts of Eyewitnesses and Combatants. Albuquerque, New Mexico: The University of New Mexico Press. Webster, Daniel (1984). Charles M. Wiltse (ed.). The Papers of Daniel Webster, Correspondence. 6. Hanover, New Hampshire: The University Press of New England. Zeh, Frederick. An Immigrant Soldier in the Mexican American War. College Station: Texas A&M Press 1995. "Treaty of Guadalupe Hidalgo". Internet Sourcebook Project. Retrieved November 26, 2008. "28th Congress, 2nd session". United States House Journal. Retrieved November 26, 2008. "29th Congress, 1st session". United States House Journal. Retrieved November 26, 2008. "28th Congress, 2nd session". United States Senate Journal. Retrieved November 26, 2008. "29th Congress, 1st session". United States Senate Journal. Retrieved November 26, 2008. 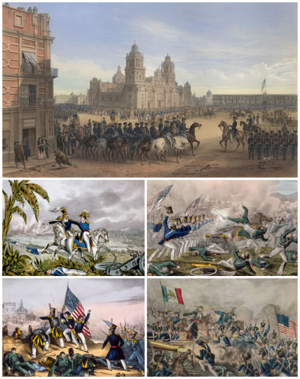 Wikimedia Commons has media related to Mexican–American War. Milton Meltzer, "Bound for the Rio Grande: Traitors—Or Martyrs", Reading, video, and lesson for high school students, 1974, Zinn Education Project/Rethinking Schools.